Have you ever thought you were about to close a deal and then, out of nowhere, your prospect stopped replying? Maybe you’d already overcome their sales objections and even gotten a soft yes from them. But something's gone wrong. 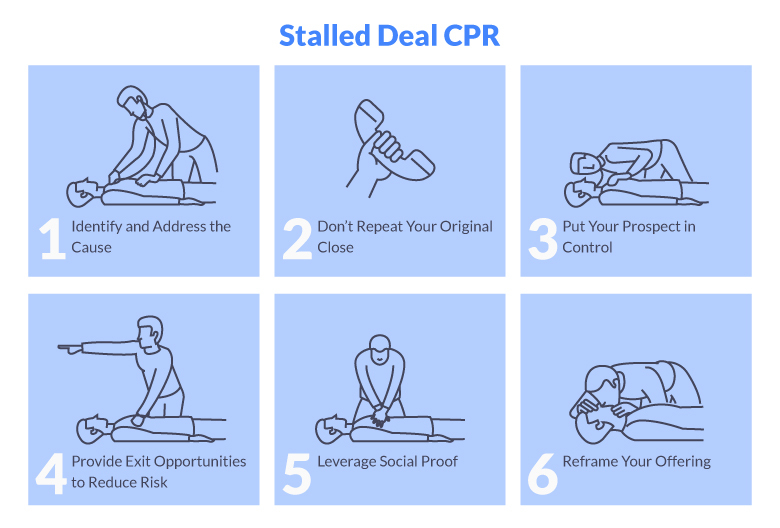 The deal has stalled – and it’s up to you to resuscitate it. What can you do to prevent all the energy and time you’ve poured into this deal from going to waste? Let’s talk about how you can respond to deals that stall. What Causes Deals to Stall in the First Place? Before we talk about how to handle stalled deals, let’s talk about why deals stall in the first place. Generally, there are three reasons that deals get stuck in limbo. The first is a lack of decision-making power. If your contact doesn’t have the authority to pull the trigger, you’re going to struggle to close the deal. Even worse, if your contact needs buy-in from an entire team of executives before making a purchase, it can take forever to get approval from everyone involved. This is a fairly common issue – especially because, according to research by CEB, the average B2B buying decision involves 6.8 different stakeholders. As a general rule, the more people involved, the more likely your deal is to stall before it crosses the finish line. A lack of resources can also cause a deal to stall. If the company you’re trying to close doesn’t currently have the budget for your solution, they might put the deal on hold. That’s why it’s so important to qualify leads early on using a lead scoring system like the BANT framework. Another issue caused by lack of resources, particularly if you’re selling tech or SaaS products, is that a new customer might feel they don’t have the time available to implement a new tool, learn how to use it, and onboard their teammates. In this case, it’s up to you to show them why your offering is worth changing up their workflow for. The third reason many deals get stuck in the pipeline? General inertia and the status quo. According to the Sales Benchmark Index, 58% of stalled deals are linked to your prospects’ desire to maintain the status quo. That is, they don’t want to do things differently – even if the change would mean long-term gains. If their current solution isn’t broken, they might fail to see the benefits of switching to your more efficient solution. So, you need to address their concerns and convince your prospect that the benefits outweigh the slight inconvenience of making the change. 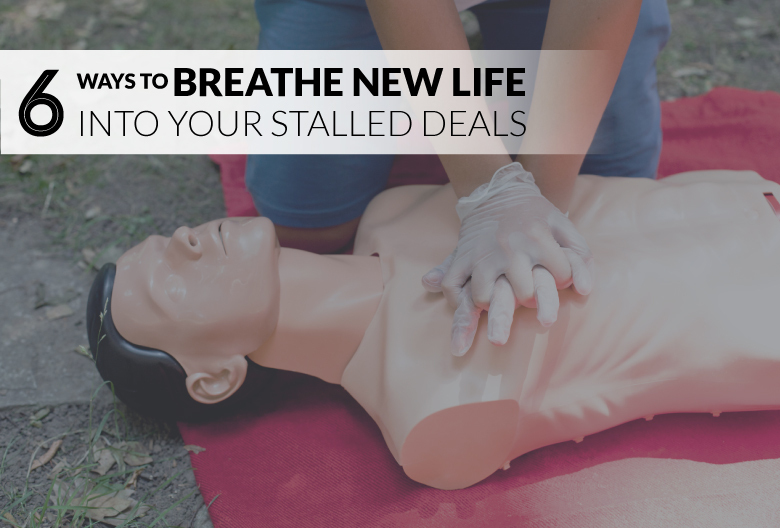 Try these six tactics to breathe new life into stalled deals and get closer to landing your next customer. Once you know exactly why a deal is stuck, you can take action to address the specific stalling point. For example, if the customer’s goals have shifted away from needing your solution, you’ll need to revisit how your offering can be tailored to meet their current needs. And if your customer is waiting on approval from one very hard to please stakeholder, you’ll need to find out exactly why they’re reluctant to get onboard – and then respond to those objections. When a deal comes to a standstill, there’s no point in attempting the exact same close that you used originally. For whatever reason, it didn’t work the first time and it won’t work now. So, you need to come at it with a lighter, fresh approach. As a general rule, it’s a good idea to aim for engagement at every stage of the sales process, rather than a definite yes or no response. As long as you can keep the conversation going, you can continue to progress the deal forward. Whatever step you’re working towards, allow a hesitant prospect to feel like they’re in control of the situation. For example, if you’re struggling to lock a prospect into a meeting time or demo date, give them a few specific times to select from. This allows you to create a concrete plan while still giving them the power to make a choice and set the final plan. Plenty of people are risk-averse – and it’s something to keep in mind when you’re trying to get a stalled deal going again. Whenever you’re dealing with a prospect who has commitment issues, provide plenty of exit opportunities to minimize the perceived level of risk. That is, make sure the prospect is well aware that they can change their mind, reschedule, or call for support at any point. For example, remind a hesitant prospect that they can always phone or email you directly if they need to reschedule a demo or ask a question about how to solution works. This minimizes the level of risk involved and makes it easier to book a meeting or move towards closing the deal without scaring them away. Whether it’s a blog post, a case study, a positive review, or a shout out from an industry influencer, social proof can have a big impact on how prospects perceive your company. And you can use social proof to give a stalled deal new momentum. Send your buyer a quick note with a link to an article, testimonial, or case study that bolsters your brand. Or simply share customer success stories of companies that had similar concerns but took the plunge to great results. This provides evidence that backs your product or service and reassures your prospect that working with you will be a positive experience. Certain prospects are more receptive to certain types of value. If your initial offer wasn’t enough to incentivize them to buy, your follow-up attempt should emphasize a different form of value provided by your product or service. Remind your prospect what they stand to gain by becoming a new customer. Whether it’s increased efficiency at the office, higher revenue for the company, or lower costs for their department, change up your pitch and frame your offering in terms of how it benefits them directly. Sometimes the only way to respond to stalled deal is to hit snooze and plan to revisit it at a later date. In these cases, you just have to be patient and give the prospect enough time put together the resources they need to move forward. However, you don’t want to completely write them off if there’s still a chance they might close next month or next quarter. With Propeller, you can place a stalled opportunity “On Hold” until you’re ready to take another look at it. This allows you to keep the deal on your radar but puts it on snooze to avoid clogging up the active stages of your pipeline. 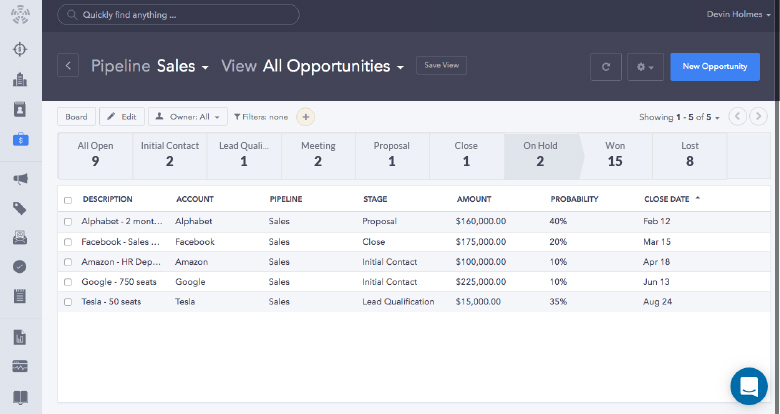 Ready to see how our CRM can help you manage your deals and close more opportunities? Start using Propeller for free today!